I don't care how proud you are of your figure, who asks their twelve year old son to wash their back in the bath and leaves the door open so he can see in when you bathe? I don't care if he does want to be a doctor, there's something wrong with that. And now the daughter wants her brother to wash her back too? No wonder they ended up like they did. Here we go. The tale we all know and love. Okay, what high school student orders pizza and salads for their wild-my-parents-are-out-of-town party? And does Kristin not see that Kane is totally gonna try to hook up with her at this party? Come on. Wow. This Kane guy is pulling out all the shots. Goodness gracious, was this book ever addicting, which is surprising since I've already read the original Dollanganger series. 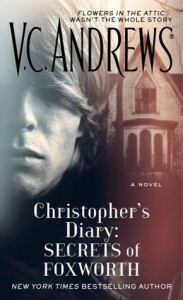 Still, hearing the series from Christopher's POV was fascinating, mostly due to analytical, optimistic personality. I have a better understanding of why he defended his mother, knowing that he was responsible for keeping his siblings happy.